Do you see anything missing? Nothing essential other than most of the content per page. At times like these my paranoia meter rises and I resist, often with difficulty, giving in to conspiracy theories. This problem started with installation of iOS 9 Beta (second now). The operating system makes changes to the Newsstand, which future role is questionable. Apple is prepping a new Flipboard-like News app and content deals with it. I always wonder who exerts pressure on whom during the licensing negotiations process. 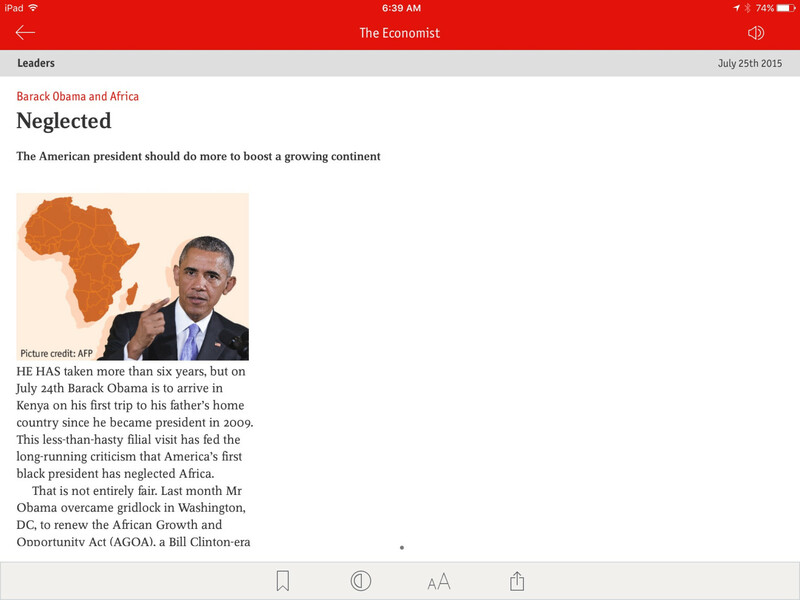 Last night, I removed then reinstalled the Economist app, looking for remedy—and got none. I am a digital-only subscriber and mainly read the magazine on the tablet, so this situation is inconvenient. My Economist reading is in state of collapse, coincidentally as my renewal date approaches. The timing is unfortunate for the mag, because I don’t fraking care who is responsible. I read some on iPhone 6 Plus but prefer the tab.